There’s nothing like a sparkling engagement ring on your finger to motivate a bride-to-be to lose weight. Whether you have a couple of pounds or a few stone to lose before the Big Day, hiring a personal trainer can really help to keep your weight-loss goals on track. Gabar Singh is the founder and owner of GS Fitness. With a background in Personal Training and PT Boxing, he’s a body transformation specialist with a proven track record of whipping clients into shape - so who better to ask the crucial questions on nutrition, health and exercise? How long have you been a personal trainer? I took up boxing from the age of ten, been weight and endurance training for the last decade, and training clients for a year now. I’m more of a fitness expert than a personal trainer. For those with serious goals in a tight time frame, I offer an intense four week program or a twelve week challenge, with a guaranteed body transformation. The plans also include guidance on healthy eating which can be tailored for each client. All the training sessions are one-to-one but working out with a friend can be more cost-effective. How effective are your plans? All the clients on my four or twelve week challenge have been thrilled with their results, particularly those who wanted to eliminate fat. For those clients who live far away or are on a strict budget, I offer a six week body transformation, which includes a step-by-step guide to training and nutrition. This is through a personalised weekly email. When’s a good time to start? Any time is good, but I find that people begin to take their health seriously when they become overweight or have a health scare. However, there's no better time to get in shape than in the run up to your wedding. The longer you give yourself to train, the better the results will be. I’d say twelve weeks is the very minimum if you want to get serious results. 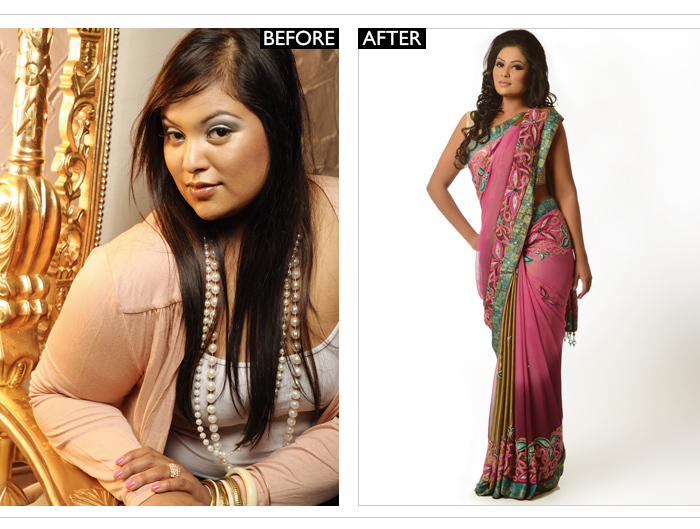 And if you need a little inspiration, just take a look at some of the before and after pictures on my website. You’ll be amazed at how far hard work and consistency can get you. How much time do you need to commit to see results? Training for a short period of time may get you results, but that’s only in the short term. It takes four weeks for you to see your body changing, eight weeks for your friends and family to notice and 12 weeks for the rest of the world. Be patient, and keep going! What are the biggest obstacles to sticking to a fitness routine? Boredom, and not seeing any changes. Training should be a life-long activity for both your health and wellbeing as well as to look and feel amazing. It’s a marathon, not a sprint. Weightloss depends on so many factors - metabolism, response to exercise, type of fat - so it’s a unique journey for each individual. Can you eat whatever you want if you exercise twice as hard? I used to think you could eat whatever you liked, along as you burned it off with exercise, until I started eating properly and began to see serious results. It’s trial and error; we all learn from our mistakes and past experiences but sometimes it can be a long process. Save your time and effort by hiring a personal trainer who can offer you the proper guidance and motivation. What’s the key to staying on track with a fitness regime? Stay committed and be consistent, that’s the key to success. The majority of my clients are out of shape because they don't have their priorities in the right order. They’ve focused their energy on climbing the career ladder rather than the most important thing; their health. But there's no point in building an empire and having an unhealthy body. As the saying goes, "Success is not the key to happiness, happiness is the key to success”. So if you’re happy with yourself, inside and out, you’ll be successful. Do faddy diet plans such as the 5:2, Paleo and Atkins work? I did the Lighter Life diet plan for three weeks when I was in my mid-20s, and yes, I lost more than a stone in three weeks. However, as soon as I began reintroducing normal food into my diet, as opposed to the Lighter Life shakes I’d been drinking, the weight just piled back on. The same goes for the Cambridge Diet, and Atkins is even worse, in my book. Diets like those just aren’t healthy for the body - you need a combination of proteins, carbohydrates and healthy fats to function properly. Can you shed pounds by high intensity interval training (HIIT)? It’s not possible to lose weight through exercise alone. I wish it was; I would have been the proud owner of a six- pack all my life! You must eat well too because exercise and nutrition go hand in hand. You can’t expect great results if you’re only willing to put in half the work. Why should people come to you to improve their fitness? Golden girl: for as long she could remember, rima had been slightly on the chubby side. coming from a large family, she’d always been encouraged to clear her plate at the dinner table and did so to please her parents. but as she turned from child to teen to adult, what she always assumed was puppy fat failed to shift. it was only at a wedding last summer, when a guest made a hurtful comment about her weight, that she decided to change forever. signing up for three weekly hour long sessions with gabar last november, rima continued her exercise regime at home alongside a healthy eating plan, seeing an amazing weightloss of just over two stone in three months.